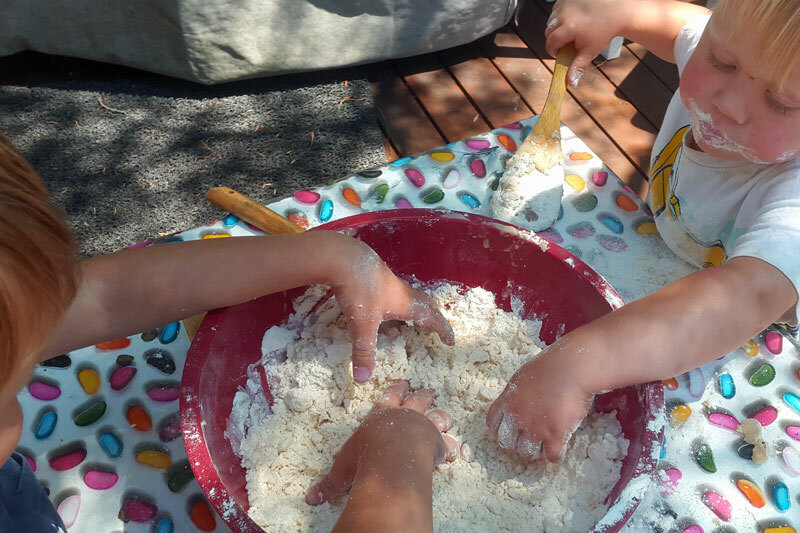 My boys love sensory play, so I thought I’d rock their world by making cloud dough with them. 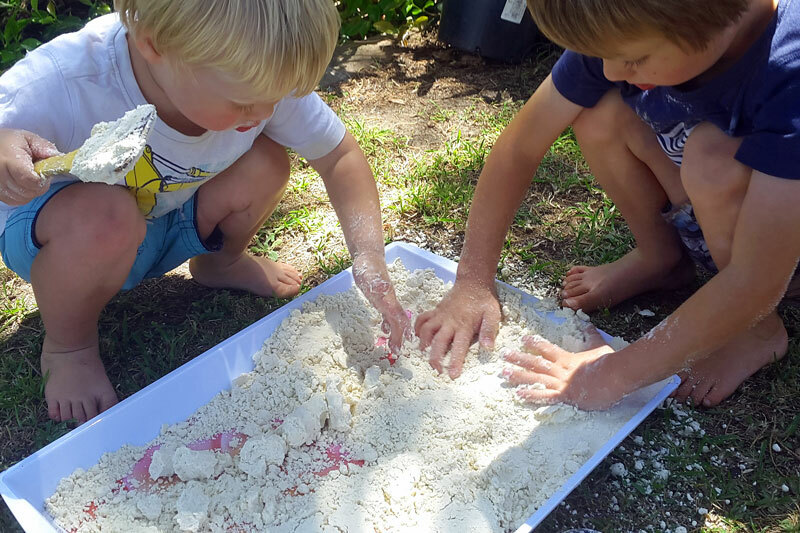 Cloud dough, also known as moon sand, is probably the easiest craft you can make with your tot. This recipe has just two edible ingredients and is safe for little taste-testers. It has a lovely, silky, mould-able texture and best of all, it smells like a piña colada! I did this activity outside as it’s very messy. 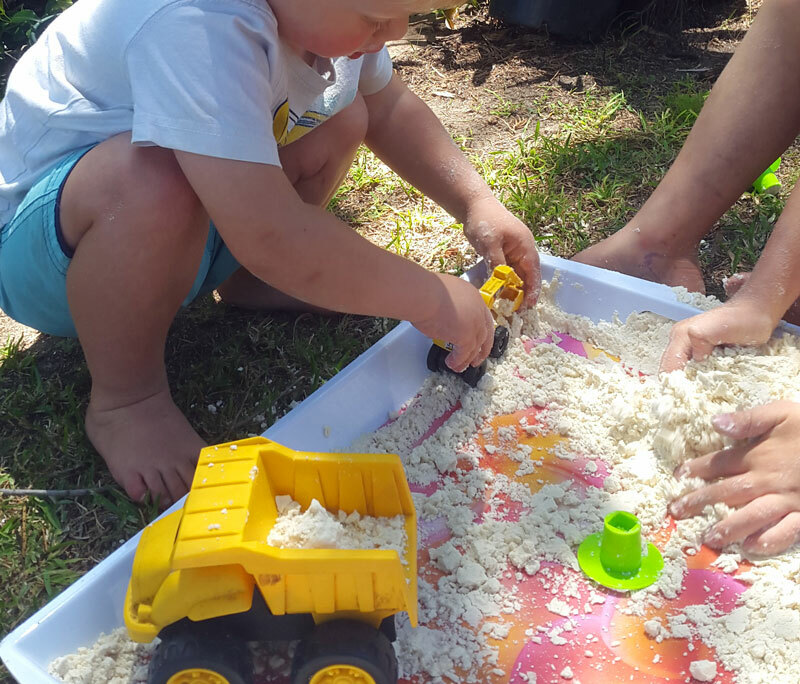 I can happily report it entertained my boys, aged four and two, for ages as they played diggers and dump trucks with the magic, squishy sand. My youngest also loved making ‘cupcakes’ using patty cases in a muffin tin. 1. If the coconut oil is solid, zap it in the microwave for a few seconds to liquify it. Place the flour in a large bowl and pour in the coconut oil. 2. Mix loosely with a wooden spoon (and expect your little one to help himself to a mouthful!). 3. Then, using your hands, rub the oil and flour in with your fingers until little soft clumps are formed (this should form a crumble-like consistency). 4. Transfer the cloud dough to a tray. Pull out the toy tucks, cars, playdough shapes, cookie cutters, a muffin tin and patty cases, and more – then watch your little one lose himself in imaginative play!